The Snellinckstraat is a typical residential street in the Middelland district, right next to the city centre. It is a small narrow street between the main city route S100, the ‘s-Gravendijkwal and the access road for the neighbourhood the Claes de Vrieslaan. This is the part of Rotterdam where the city centre ends and the ordinary working-class neighbourhoods begin. Therefore, there are no shops, offices or restaurants in this street. It is a quiet street with the busy city around the corner. The Snellinckstraat, as well as many of the parallel streets, is a narrow one-way street to prevent conflicts between cars travelling in opposite directions. The advantage of this is, that it is now possible to increase the number of parking spots by applying them on two both sides of the road so people can park their car in front of their front door. The ideal image for the Snellinckstraat is a lively city street. 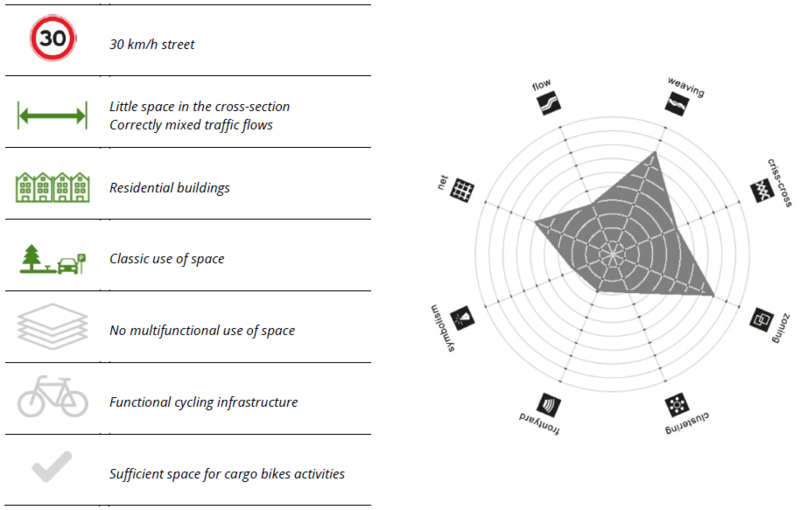 Two domains (or even one shared space) would suit this best. The sidewalk should be physically separated from the roadway. 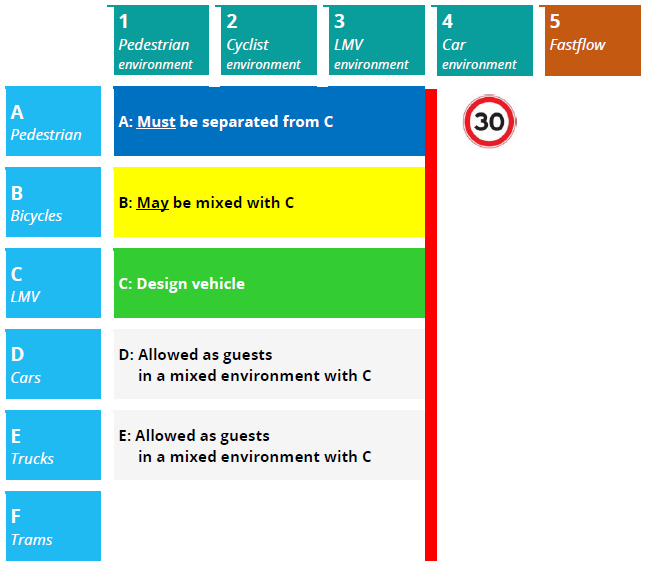 The space on the road is shared between cyclists and light motor vehicles, the latter category being the norm for the design. Cars and trucks are admitted as a guest. The current 30 km/h zone is appropriate for this layout. However, the quality of the public space is still low, because the cosy residential function has been overpowered by the parking function. Having the car at your door is still a practical requirement for many people, which is more important than the quality of public space. Streets do not come alive here as much as in the centre and as much as in other, more child-friendly neighbourhoods. 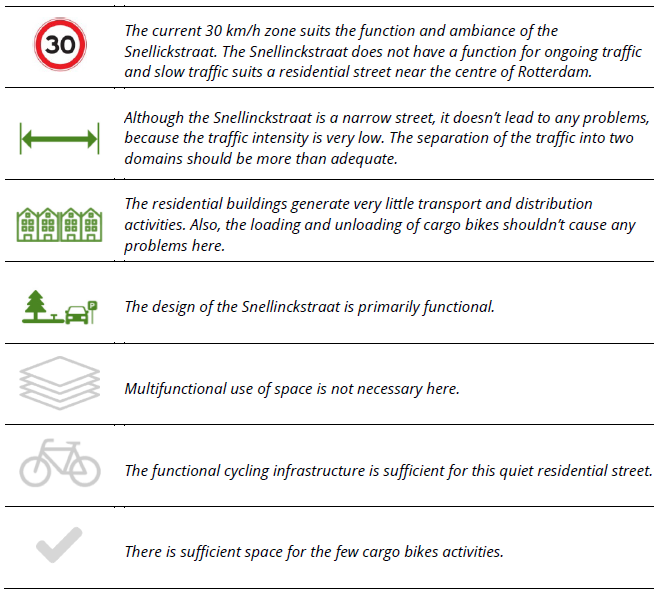 It appears, from the scoring of the quality aspects of Functional Ambiance, that the quality of the Snellinckstraat is very low. Most aspects are of insufficient quality and come secondary to the functionality. This undermines any attempt to improve the streets ambiance. The removal of the cars on the street will be a step too far for many residents. That is why it will not make much sense now to implement the aspects of Functional Ambiance in these types of streets. In larger streets and streets near parking lots or parking garages, the ambiance can be improved. The parking of cargo bikes in this type of streets should therefore not lead any disturbance. Besides, small cargo bikes can easily park on the sidewalks temporarily.